Mango is one of the most economically important fruit facing greater problems in storage and transportation to long distance market because of its perishable nature. Evidence suggested that application of edible coatings is a key step to reduce loss of perishable commodities. 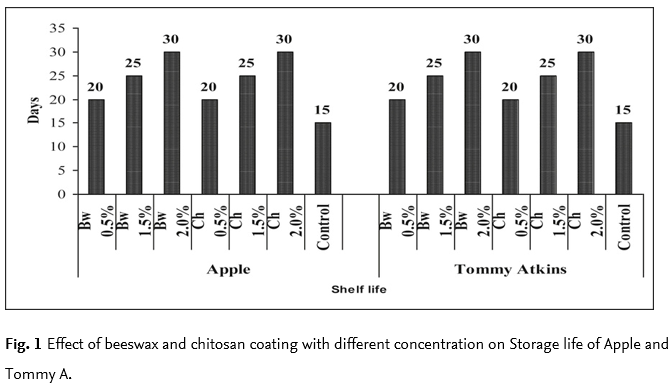 In line with this, Beeswax and chitosan at different concentrations (0.5%, 1.5% and 2%), and two mango varieties (Apple and Tommy Atkins) were evaluated using completely randomized design (CRD) in three replications. Application of beeswax and chitosan at (2%) significantly reduced physiological weight loss (%), total soluble solid (°Brix), titratable acidity (%), pH, disease incidence (%), disease index (%), maintained Firmness (N) and prolonged shelf-life of fruits compared with untreated control. 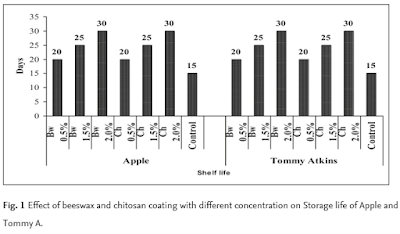 It was concluded that edible coatings used in the present study have a good potential in maintaining the fruit quality and beeswax at 2% being the most effective treatment on all parameters tested.